How to: back a Hi5. Want to 'like' a Hi5? Here's how. If you see a Hi5 given to a co-worker that you agree with, you can 'like' it by backing the Hi5. Go to your Hi5 Wall of Fame. Scroll down & browse the Wall of Fame for a Hi5 that you agree with & would like to back. 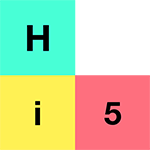 Once you've found a Hi5 that rings true to you, you can hover over the grey hand icon on the Hi5 (it will say Back this Hi5) and simply click the grey hand icon. Good to know: You can only back Hi5's from the current month, and you can only back a Hi5 once. You can't back your own Hi5's either (that's cheating 😜). The hand icon turns salmon red once it has been backed by someone! Well done! You've backed a Hi5! Backing a Hi5 does NOT use any of your Hi5’s for the month - so go wild!